With the amount of student debt on the rise along with the cost of college tuition, the focus on getting good grades in high school to secure scholarships or grants is critical. More students are also applying for grants and scholarships, which makes the need to have top scores and grades greater than ever to be distinguished from the crowd. But grades aren’t the only important factor. Another one of the key areas universities and colleges look at when it comes to admittance and scholarships are ACT or SAT scores. The average ACT score most universities require is a 21. Some universities are more interested in SAT scores and like to see an average score of about 1300. But depending on the school you or your student is trying to be accepted into, a much higher score may be needed. These college entrance exams are tough and usually require at least a few hours to complete. They’re also expensive, and most students take them at least twice to improve their scores as much as possible. At the time of this writing, the ACT costs $39.50 and $56.50 to add the writing portion to the test. At roughly $40 an exam, this cost can add up quickly if you have to take the test multiple times to get a score you are happy with. The SAT costs slightly more at $43 per test and $54.50 to take it with the writing portion. With all that’s riding on a good ACT or SAT score, studying for the test is vital. But how you go about it depends on your budget. 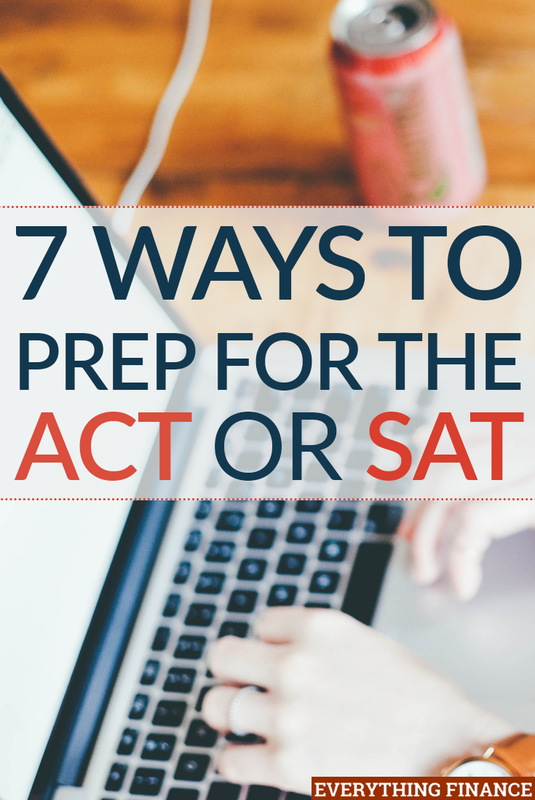 Here are 7 options to consider for ACT/SAT prep. By far the cheapest option for ACT/SAT prep is to attend these classes at a local high school. Many high schools offer specific sessions for high school juniors and seniors to attend to practice for the college entrance exams. These may be held during regular school hours instead of a “study hall”, or they could be after-school or on the weekends. There are several ACT/SAT prep books available that give you example questions, strategies, and practice tests. These range from $30-$50 depending on the book and what is included with it. These are good to have and read even if you hire a tutor or use another prep method. Another option is to study prep books yourself and ask your high school teachers to explain the questions you missed on the practice tests. Keep in mind that while buying a few books is a cheaper option, they are certainly not fun. Less motivated students may be reluctant to use these books on their own to adequately prepare for their upcoming college entrance exams. But more expensive options, like a tutor, may offer more accountability and assistance with test prep. Hiring a tutor is one way to prepare for college entrance exams. The price for a tutor varies depending on location, how knowledgeable they are, and what you can afford. The starting fee for a quality one-on-one tutor is around $50 per hour and only goes up from there. If you are from a wealthy school district, you’re probably competing for the same tutor with several other high school students and parents, thus prices will be higher. Remember, if you are studying for nine hours, the tutor doesn’t need to be there the whole time. Let that hour of time together drive independent study to help you save money. The cost of an ACT/SAT tutor may be more budget-friendly if you are able to set up a study group. Some private tutors offer packages that cost less per person if they are working with a small group of students at the same time. Plus, students may be able to work together on things they do or don’t understand, making test prep a little more fun along the way. There are programs available online that help you prep for the ACT or SAT. These plans range from $20 for an online guide and books to a full eighteen hour course for close to $500. Depending on how much a tutor in your area costs per hour, this may be a cheaper option even if you decide to go for the whole eighteen hour course. Some universities offer ACT or SAT prep courses where the high school student attends a class for a certain number of hours. This cost can range from $75 to $500. There, a tutor or instructor can lead discussion and answer questions about the practice tests and material. Some programs provide a refund if the prep classes taken did not improve the students test score. Some companies offer ACT or SAT prep camps that are generally held during summer or holiday breaks. They are intensive with all-day classes and lots of practices tests, almost like being in school. But, students often emerge with lots of experience, which may help their nerves come test day and consequently improve their scores. These camps do come at a hefty price with some costing up to $5,000 for one subject area or course. There are several options out there for you or your student to consider when it comes time to prep for college entrance exams, and parents can spend as much or as little money as they want to help their students be prepared. But it’s worth mentioning that even the best prep courses may not be enough if the student isn’t motivated to do well or is a poor test taker. Even then, their scores may not be up to par despite all of their practice and preparation time. How did you prepare for college entrance exams? Do you think it’s worth spending the money on expensive test prep options? How Much Does a Lack of Education Really Cost? Lifelong learning – How can it help you financially?